Enter your details below to ask a question or get a quote. Please fill out the form below to proceed with your download. 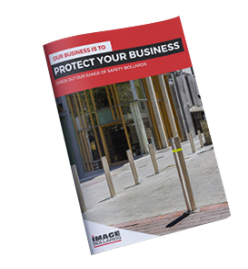 Permanent bollards are ideal as they help protect your business and property 24/7. Always present and always a deterrent against ram raids and vehicle access. These are available in various types and various powder coated colours to suit all locations and décor. 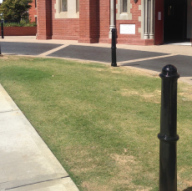 Retractable bollards offer the perfect solution for businesses that are looking to grant access during certain times of the day and restrict access at other times. An excellent way to protect parking areas from unwanted vehicles outside of business hours but, can be retracted to allow visitors and customers to your premises during trading hours. 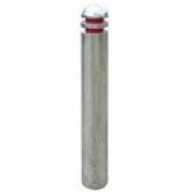 Our extensive range of removable bollards include round or square section and can be padlocked or have a key lock in the post. There are two types – in-ground sleeve or a surface mounted sleeve. 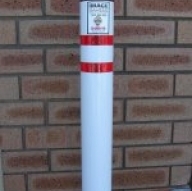 We have the Okal Sentry lock-in bollard that has a Key lock in the post and once unlocked from the surface mounted plate it can be removed and stored. 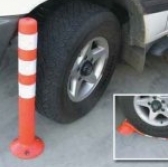 The Cam lock removable bollard also unlocks from its surface mounted sleeve for gaining access. 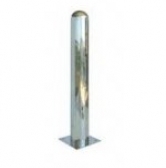 Stainless Steel Bollards look fantastic and are often selected by architects who are looking for that upmarket look and feel. 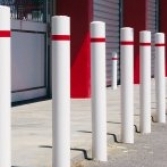 All our bollards are of the highest quality and offer protection from ram raids. Restrict vehicle access as and when it suits you. 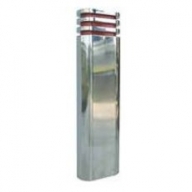 We have permanent stainless steel bollards, lift assist stainless steel bollards, retractable stainless steel bollards and removable stainless steel bollards. Contact us now to see how we can help protect your business.areas from unwanted vehicles outside of business hours but, can be retracted to allow visitors and customers to your premises during trading hours. 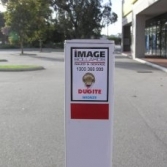 Our Dugite Platinum lift assisted bollards do just that- when you turn the key to release the bollard post a gas strut pushes it up to full height. No heavy lifting required and it locks into place once full extended. 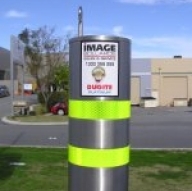 Supplied powder coated white gloss with two red reflective bands while the Dugite Platinum stainless steel lift assisted bollard has two yellow reflective bands. Both come with two turn keys per bollard. For convenience both models come in 600mm and 900mm High. and property 24/7. Always present and always a deterrent against ram raids and vehicle access. These are available in various types and various powder coated colours to suit all locations and décor. 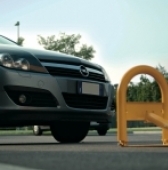 Designed to protect your car bay from unauthorised parkers: Keylockable - sets can be keyed alike. Lays flat on the ground when access is required. Standard fixings included - security nuts available on request (additional). Easy bolt-on installation. 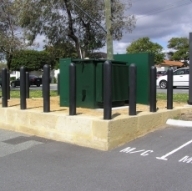 Bolt cages available for installation into bitumen. 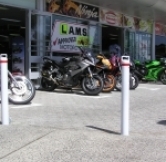 As an alternative we also sell removable lock-in parking bollards. 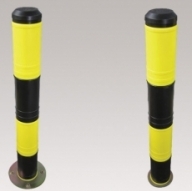 Flexible bollards are ideal for lane delineation, they are made from long life Polyethylene and are rebound able, highly visible, and durable with a “Vertical memory”. The one piece flexible bollard is available in 450mm or 800mm High and can be bolted down. 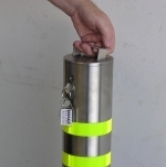 The two piece flexible bollard, known as “knockdown bollard” has a strong elastic cord internally that ensures the bollard returns to its upright position. Pilomat specialises in impact tested, crash rated bollards like the SP1000 Automatic Rising Bollard which successfully arrested a fully laden 7.5 tonne truck on two separate occasions at a testing facility in the UK. 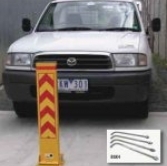 Each test resulted in a complete ‘dead stop’ of the vehicle and the bollard continuing to function. 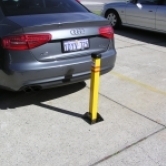 Automatic bollards make it easy to stay in control of access to designated areas without having to physically get out of your vehicle to raise or lower the bollards yourself. 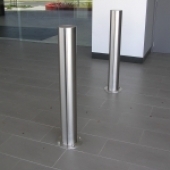 Stainless steel decorative bollards make a classy addition to any complex and provide reliable security for your business. 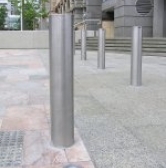 Permanent bollards are used to protect buildings from being hit by vehicles, but others like our decorative stainless steel bollard range are used to give a sleek, crisp image to a classy building or location. 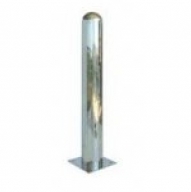 Our decorative stainless steel bollards come in 304 grade stainless with a brushed or polished finish. 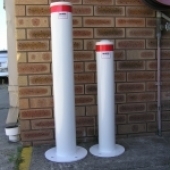 AUSTRALIA'S BEST VALUE BOLLARDS. GUARANTEED! Please fill out the form below to get a free quote. Website designed and built with ♥ by Dilate.